Today is Thursday, April 4th, 2019. I’m Greg Doig, with your W-V-B-I Community Calendar. Thursday, Pickleball at the BIC Center from 9:30 to 11:30. Euchre Thursday evening at Stoney. Cards hit the table at 7. Arthritis Foundation Exercise Program is from 10 to 11 Friday in Carol’s Hangout here at the BIC Center. And, if you are looking for exercise, don’t forget about B-I Fit at the school. Details, sign-up info and times are on the school website under the B-I Fit tab. Go to beaver island dot k-12 dot M-I dot U-S.
Saturday, Lego Club at the Library at 1. Self defense class at Peaine Township hall at 5. Also this weekend, two great feature films at the BIC Center: Aquaman is at 4 on Saturday and 5 on Sunday. It’s great fun and rated P-G 13. And at 7 on Saturday , it’s The Man Who Killed Hitler and Then The Big Foot starring Sam Elliot. It’s not rated, but it is for grown-ups. Concession stand will be open for both movies. Popcorn, pretzels, sweets, Nathan’s hotdogs with chips and pop from the soda fountain. If you are a boater interested in a seasonal slip at the municipal marina, it looks like there will be one available this year. If you are interested, the deadline to sign up for it is April 12. If there is more than one applicant, a selection will be made by lottery. And, Beaver Island Marina has announced they are taking reservations for seasonal slips at their marina starting April 1. If you are looking for a job this summer, St. James Township is looking for two dock attendants for the municipal marina. They’ve started to review applications, though, so best to get your application in soon if you are interested. Lots of other summer job opportunities out there: McDonough’s Market, Paradise Bay Coffee, Dalwhinnie’s, the Shamrock, Daddy Franks, Island Airways and Stoney all say they are looking for seasonal help. You can find more information on all of these events and everything else that’s happening on the island at calendar dot w-v-b-I dot net. Weather, here there and everywhere – presented every day with the support of the good folks down at McDonough’s Market: Today Partly Cloudy. High 38F. 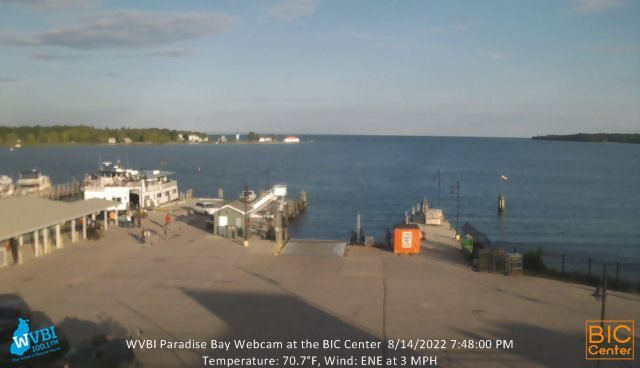 Winds E at 5 to 10 mph.<www.wunderground.com/hourly/us/mi/beaver-island/KMIBEAVE9/date/2019-04-04?cm_ven=localwx_modtoday> Tonight Snow Showers Late. Low near 30F. Winds ESE at 5 to 10 mph.<www.wunderground.com/hourly/us/mi/beaver-island/KMIBEAVE9/date/2019-04-04?cm_ven=localwx_modtonight> Friday Rain showers, snow showers, and freezing rain likely, becoming all rain showers after 11am, then gradually ending. Cloudy, with a high near 41. Southeast wind 5 to 10 mph becoming south in the afternoon. Chance of precipitation is 60%. New snow accumulation of less than a half inch possible. Friday Night Mostly cloudy, with a low around 34. Looking ahead to the weekend, some rain Saturday with a high near 48. Rain showers with a high near 51. Lows both nights around 39. TRAFFIC: No delays anywhere on the island thanks to the great work of our road crews. But where ever you’re driving, let’s be careful out there. Especially in the school zone. Don’t forget about the Ice Classic going on now. Make the best prediction of when the buoy goes through the ice and you’ll take home half the entry fees—other half goes to support your community radio station and your community Center. You can buy your entry here at the BIC Center. Details and rules are available at bic center dot org. Just click the Ice Classic menu at the top. On a lighter note… What do you call dangerous precipitation? That’s the W-V-B-I Community Calendar for Thursday, April 4th, 2019. I’m Greg Doig at the pest free Hogarth Pest Control Studios of the Voice of Beaver Island wishing you a great day and asking you: why not make it the best day ever? And, thanks for listening.